I can see now that this hive gets enough sunlight in the morning (this photo was taken around 10:30am on December 1st, 2016). It also gets more sunlight at the very end of the day. I’m not too concerned now. This entry was posted in Hive Wrap, Money, Month of November and tagged Practical Tips, Video. Bookmark the permalink. Mike Paterson, me, and I think Jeff Harris are sticking with roofing felt. We like the thermal-absorbtive quality of the black material and the possibility that it “breaths” better than various forms of plastic wrapping. Ventilation is key, as you know. We don’t want materials that trap moisture. Thanks for the post, Phillip! I’m still not convinced that wrapping is even necessary all the time. It depends on the health of the colonies, the local climate (e.g., high winds, amount of direct sunlight), the colour of the hives (dark or light), etc. At least two of my hives this winter won’t have any wrap. They’re painted dark green, will get plenty of direct sunlight and are sheltered from heavy winds by surrounding spruce trees. I think they’ll be fine. I’ll know next spring. The hives that I have wrapped, however, don’t get much direct sunlight, and one of them is only a single deep (less bees = less generated heat) — that puts them at a disadvantage. So I’m hoping the black wrap will at least prevent them from freezing for any extended periods of time. I’ve talked to at least a dozen beekeepers about wrapping in the past year. I know four beekeepers in the UK, and none of them wrap. I know six beekeepers in the US, some well respected beekeepers too, and two of them don’t wrap, two of them do, and the other two wrap sometimes but not all the time. None of these beekeepers live in Newfoundland, but they all have some aspects of their winters that are similar to ours. At any rate, what I’ve gleaned from most of the conversations I’ve had is that wrapping with roofing felt isn’t always necessary, but overall, it doesn’t hurt. Commercial wraps are less of a known quantity. Roofing felt can get a bit damp at times, depending on local conditions. That’s pretty much the only downside. For me, most commercial wraps seem like overkill. I keep repeating myself because I believe it’s true: The bees don’t need to be warm during the winter months. They just need to be warm enough to break cluster from time to time so they can access their honey stores. The more costly commercially available hive wraps may keep the bees so warm that they’re more active and subsequently eat through their honey stores before winter, increasing the likelihood of starvation and other messy situations that can arise from having to keep the bees alive on sugar. I might consider one of the commercial wraps if I had my hives out in a field that gets battered by cold heavy winter winds, some place where I know it could get extremely cold for long periods of time. But I’ve never had that. I know a few people who are wrapping their hives in the commercial hive wraps. I’m curious to see how well their colonies come through in the spring. I’d imagine they come through okay, but do they have any honey stores left, or do they need 30 litres of syrup to keep them alive until the first nectar flow? In the end, you do what works best for you. I’m still not saying any way is better or worse than the other. But I think roofing felt offers the most affordable, simplest method for winter wrapping. I just updated this post with some photos to illustrate what I’m talking about. Do you leave your bottom boards on for the winter? I am a new beekeeper and have been told both ways. Feel like the board should be left off due to moisture. I’m in Newfoundland where I’m pretty sure solid bottom boards are more common than screened bottom boards. In our climate, I think most people go with solid bottom boards all year round. However, I used a screened and open bottom board on one of my hives for two winters and had no problems with it. I made sure the hive was protected from strong winds. But otherwise, kept the bottom open all winter. It all depends on your local climate and the kind of set up you have with your hives, how much ventilation they already have, etc. And don’t listen to anyone with less than three years experience. The safest bet when you’re starting out to do what works best for beekeepers in your area. Is a moisture quilt necessary for a hive in partial shade and screened bottom? If you find condensation building up inside your hives sometime in the winter, add a moisture quilt. That’s the easiest approach. Not every hive in every in every climate needs a moisture quilt. A screened bottom board definitely helps with ventilation, but excess condensation can come from having a large colony (more bees = more respiration), a local humid climate, and other factors. I know beekeepers in humid climates with screened bottom boards who use moisture quilts. Much of it depends on your local climate. I switched to moisture quilts because I moved my hives at the time to a new location where they were bathed in fog all winter. Some of the hives, even with screened bottom boards, were dripping with moisture, but all them were cold and damp. The moisture quilts removed all the moisture and the dampness from the hives within a week. Bone dry. Quite amazing. Where I keep my bees now doesn’t seem to be as bad. I’m experimenting this year. I have moisture quilts on about 4 or 5 of my hives. Hard insulation over the inner covers (with upper entrances) on others. 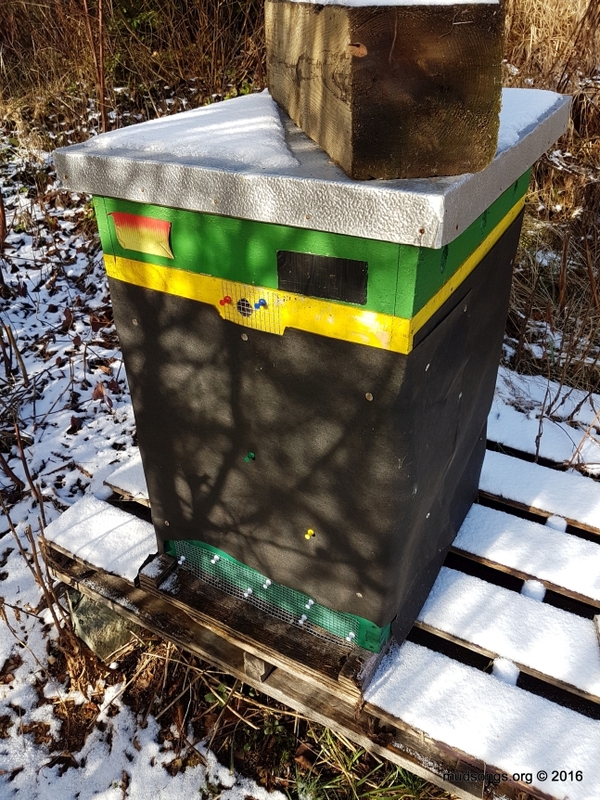 And one hive has a regular inner cover, a ventilation rim over the inner cover, and then a piece of hard insulation on the top, which is similar to what some people call a D.E. Hive but it also known simply as a ventilation box in most parts of the world. At any rate, there are a few options for keeping the hives well ventilated in the winter.